A new program being piloted in the Renfrew County Catholic District School Board introduces students to robotics by building models featuring working motors and sensors along with a computer software component. The program blends hands-on manipulatives with technology to engage and motivate students while developing skills in science, technology, engineering, and mathematics as well as language, literacy, and social studies. There are two levels of robotic kits. The Lego® WeDo® kit is suitable for junior students and has been piloted at Holy Name Catholic School. Students in Scott Lafreniere’s grade 2/3 class quickly learned how to navigate the graphical programming language creating programs to drive and animate their robots. “The students were excited and engaged, building a number of programmable machines and robots,” notes Wayne Campbell, Hila Science Camps. The Lego® MindStorms® EV3 robotic platform offers a challenging, sophisticated robotic program for intermediate students. It is currently being piloted at Bishop Smith Catholic High School (BSCHS) in Damien Solar’s grade 10 science class. Students work on constructing and creating programs for the EV3 Rover, which requires manipulating blocks of code. “Students quickly learn how to assemble blocks of code creating programs that direct their Rover through a complex series of moves,” says Campbell. All grade 8 students at BSCHS will be introduced to the robotics program, learning to code and control a Mindstorms® robot. With the positive feedback received, the robotics initiative will also be offered to other schools throughout the board, as part of the regular Science Lighthouse program, and as a component of the Advanced Learners program. 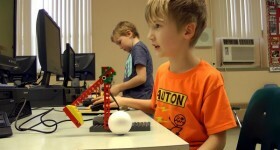 “The WeDo® and MindStorms® initiatives are exciting additions to our curriculum resources. The robotics program provides another opportunity for creativity and problem solving in our classrooms to enhance our students’ 21st Century learning skills,” concludes Michele Arbour, RCCDSB Director of Education.